If you fancy a retro bike that can handle Tarmac and dirt, then you've just had your options increased. In addition to the trials-style Royal Enfield produced by the firm itself, it appears UK distributor Watsonian-Squire has created a version based on the new lean burn Bullett Electra X road bike. 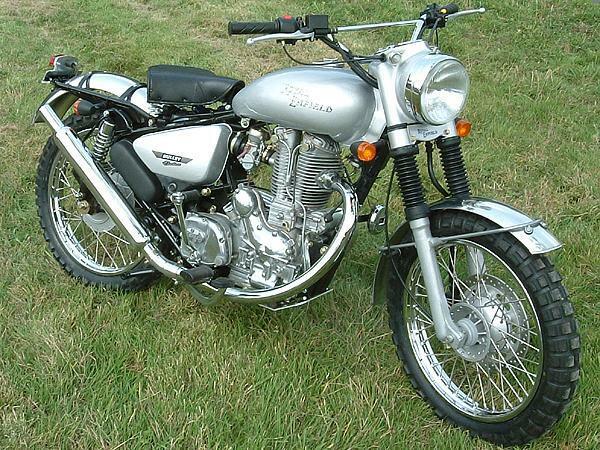 The Royal Enfield Electra 500-T carries the Electra 499cc all-aluminium OHV single cylinder engine. It also shares the frame, running gear, five speed gearbox, 280mm single front disc and gas-filled rear dampers, as well as an electirc start. The modifications include alloy mudguards, scrambler handlebars, solo sprung saddle, revised rear subframe and tail light assembly, alloy bash plate, smaller indicators and sports silencer. It also comes with Continental TKC 80 rally tyes for dual sports use. The 500-T has a claimed top speed of 78mph, with around 87.5mpg. It's only available in silver, and costs £3995 on the road. Contact: 01386-700907.